ONE DOG TRAINING & SERVICES IS LOOKING FOR PEOPLE LOVERS (and DOG LOVERS). IS THAT YOU? We are looking to hire A Part-time Executive Assistant for our small team who can help us with all the 1000 details of a fast-growing start-up like ours. 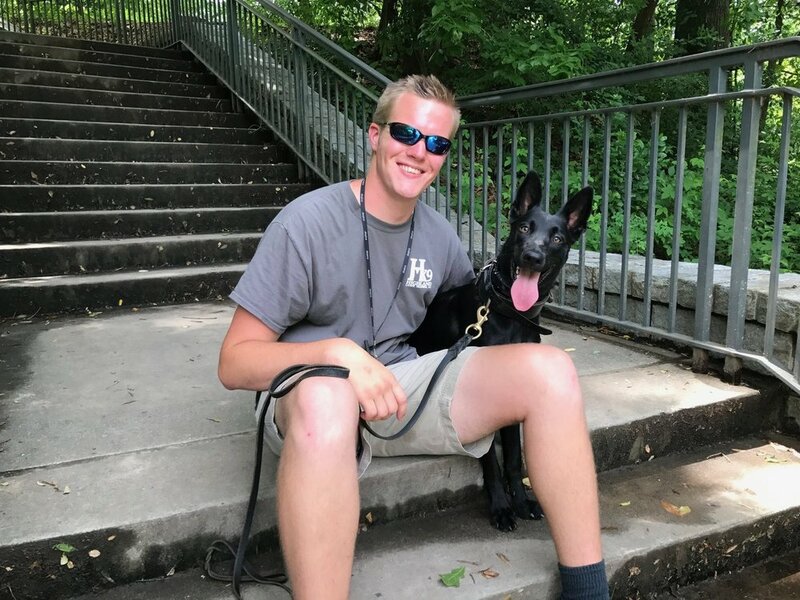 Corey, our Master Dog Trainer, and his favorite pup, Mia. One Dog Training is a family owned and operated start-up right here in the Mid-South. We are on a mission to help families with dogs thrive by teaching them the 6 basic commands (sit, stay, lie down, place, come & heel) while getting rid of the most common problem behaviors (pulling on the leash, jumping up on visitors, etc). Our clients don’t want to be *that family* in the park with the uncontrollable canine who is pulling on the leash and trying to chase every squirrel, but instead want to be “that family” that just strides along coolly in the neighborhood with dogs who obey every command so that they can enjoy the beautiful day. Make sense? This is a really cool job (I mean, seriously, who ever even thought of being a flipping’ dog trainer!? How fun! ), the pay is good and we really love the team we’ve built so far. We love our clients to death and we love seeing families enjoying their dogs again so quickly. And most of all, we love working with these eager pups who just want to understand what their families are trying to saying to them. As you can see, this work has a really substantial impact on the lives of these families, bringing a household from stressful and chaotic, to peaceful and happy...all within just a few sessions with our trainers. It’s a lot easier than you might think. We are legitimately getting more calls each week from families who need our help than we can handle, and we couldn’t be more pleased! To keep growing at this pace, each team member is focusing on doing their part without much management. So, the next teammate we’re looking for will be intelligent, naturally driven to help others and has the ability to work independently (once trained). A trainer using treats to reward an attentive dog. - Wake up looking forward to work! - Do work that actually matters, having a direct impact on the quality of our client’ lives. (If you’ve ever had an unruly dog, you know what we mean). - Join a team of who takes their personal and professional development seriously. You will grow into a better version of you by merely being around all of us. No kidding. - Make about $12 an hour plus performance bonuses. A happy client graduates from our obedience program. Here’s what will be required of our new team member. You must be aligned with our mission to want to help dog families thrive. You must love people, being organized and being self-managed. You must be naturally personable with good people skills and communication skills. You must be very self-disciplined, on-time, LOVE to learn & be motivated to succeed and grow. Because we value freedom so much and trust our team so much, we expect nothing less than someone who governs themselves well. You must have a reliable and nice-looking vehicle which you can proudly park in the driveway of an upper class home and which can get you anywhere in a 30 mile radius. You must have a decent driving record, background check and be able to pass a drug test. You must be coachable and be willing to follow protocols. We love new ideas and each personality on the team, but there are a handful of things that must be done EXACTLY without variation or “putting your spin on it” so if that would drive you crazy, this might not be for you. None of these “MUSTs” are up for negotiation. If this sounds like you, then please keep reading as we really are going to train someone to be a pro dog trainer if they are the right person. If not, then to save us both time, please do not apply because you would be exposed on the first ride day….and who wants that? - Follow behind our trainers to ensure accuracy and quality with all of their paperwork (they are messy folks by nature so aren’t always so good with the organizational stuff, so that’s where you come in). - And again, doing all sorts of things that we cannot possibly foresee right now. You get the idea. - It could be 5 or 10 hours a week for One Dog, but the owners actually have a few businesses, so you might end up working for several of the businesses which would add to the time you work, including a salon, a men’s ministry, a marketing firm, etc. Will helping our team be enjoyable? Most of the time. Will working for us be meaningful as you help us change the world for dog owners? Yes! Think of our company like a pro sports team: It’s a blast, and glorious, and pays ok, but it requires a lot of discipline and hard work and technical skills. Each member on the team takes our work very seriously. We are here to make life enjoyable for dog owners and change the world for them and their dogs. If you made it this far, we are eager to talk to anyone who thinks that they would make a good fit on our team. Click the button below to tell us about yourself so we can reach out to you hitting the ground running.